The equity momentum from last week continued on Monday after the Chinese inflation beat at 0130. SPX, DJIA and NDX all made closing all-time highs again, and NKY posted a 21-year high. However DAX and FTSE did not join the party and ended the day slightly down. USD was up across the board, following bond yields, and Gold was down. Following fighting in the oil-strategic Iraqi city of Kirkuk, WTI climbed 0.8%, at one point touching $52.34, a three-week high. There was no stopping indices again on Tuesday, and SPX and DJIA again posted closing ATHs, as did DAX (despite the ZEW Sentiment miss at 0900). DJIA touched 23,000 in the daytime and NKY hit a new high, as markets continued to await the Trump tax reforms. DXY was also up again, partly on speculation that Trump might replace Janet Yellen with someone more hawkish on monetary policy. USD rose against all currencies except CAD, which followed Oil up (after a spike down). In line, Gold was down and bond yields were up again. In particular GBP fell sharply on the UK inflation print. It came in as expected at 3.0% but by not beating, may have reduced the certainty felt about a November rate hike. Another day, another set of highs. On Wednesday, FTSE (which was up) was the only index not to make another all-time high. In particular the DJIA was boosted by a revenue and EPS beat by IBM. The stock rose 9%. As IBM’s weight is 6.18% of the DJIA, this alone translated to 128 points (23,000 x 9% x 6.18%) of the 175 point gain on the day. Treasury Sec Mnuchin warned that the current market boom was based on tax cut anticipation, and in a thinly veiled warning to Congress, that if this were not delivered, the market would reverse by “a significant amount”. If the crash does come soon, we now know upon what hook the history books will blame it. The currency picture was more mixed. 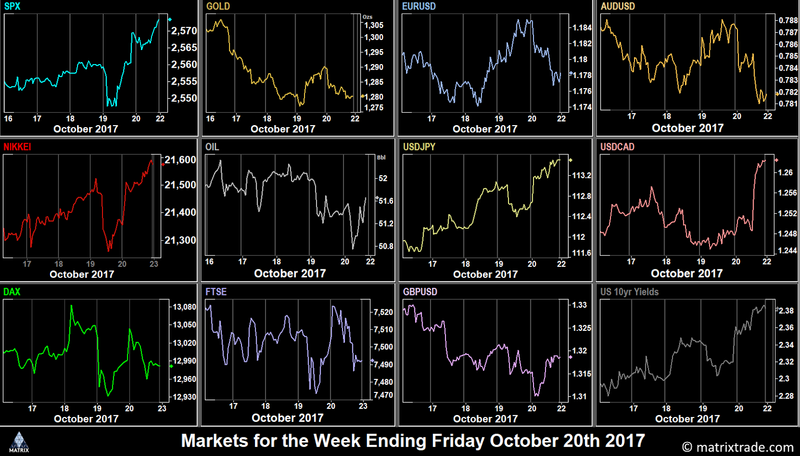 With equities moving like this, the market is obviously risk-on, and so as you would expect Gold and JPY fell, and bond yields were up. However other currencies manage to edge up slightly against USD, and with a particularly strong showing for EUR, DXY ended 0.07% down on the day. Oil had a quiet day, ending roughly flat after trading only a 1% range. Maybe it was superstition. Maybe the markets are overbought. Maybe it was the fact that Chinese GDP only came in as expected at 0300, but the 30th anniversary of the 1987 crash on Thursday brought a 168 point (0.73%) fade in DJIA during the Asian session, the largest pullback for six weeks. All other indices followed suit. However, as soon as the European session opened, the indices recovered, and once again SPX made an all-time high, and other indices ended at least flat. However NDX underperformed as AAPL shares fell 2.4% on rumours of weak demand for the iPhone 8. Currencies were very mixed. EUR, AUD and JPY were all down, whereas CAD and GBP were up. NZD was sharply down 2% on news that the incumbent National Party were unable to form a coalition, and the Labour Party will be the new government. Gold recovered a little after falling for three days, but Oil eased a little after a good run. The bullish trend continued on Friday, as the US Senate passed the budget, paving the way for the long-awaited Trump tax reforms. All indices ramped sharply in the Asian session, although DAX and FTSE gave up some of those gains as the day continued. SPX and NKY however finished the week on new highs. USD performed equally well, with DXY up 0.53% on the day. All currencies and Gold retreated sharply. The effect was particularly seen in CAD after a miss on the relatively unimportant Retail Sales produced an immediate 0.79% rise in USDCAD which had extended to 1.26% by the end of the day. NZD also continued downwards, to break the psychological 0.70 barrier for the first time in five months. Oil spiked down in early trading but ended the day flat. 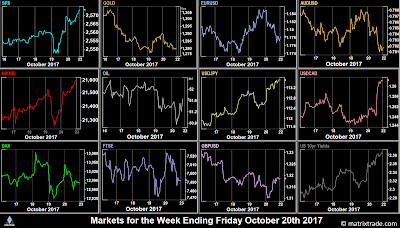 Despite all this volatility, EUR, AUD and GBP all had inside weeks for the first time since March in the case of the latter two. These are the prices movements for the week on the instruments we cover. The dollar was up across the board, and best forex trade of the week would have been short NZDUSD at 3.00%. The strongest index movement was again the NKY up 1.43%, following USDJPY. The largest overall movement was NZDUSD. Over the weekend is the Japanese election. It is expected that incumbent Shinzo Abe’s LDP will win with a comfortable majority, especially as traditional challenger, the Democratic Party has collapsed. President Trump is expected to nominate the new Fed Chair on Nov 2nd, and according to a CNBC Survey, Wall Street professionals expect Fed Reserve Governor Jay Powell to be nominated, although they would prefer Yellen’s reappointment. Powell is regarded to be similar to Yellen on the dove-hawk scale. The other two likely candidates John Taylor and Kevin Warsh are much more hawkish. Last week the US budget, which paves the way for tax cuts was passed by the US Senate. On Monday, the process starts in the House of Representatives. The sticking points will be in the detail, especially on state and local taxes. Fast resolution could be positive for the market. The New Zealand market is closed for Labour Day, which may depress Sunday evening trading, although Globex is still open. Tuesday sees the monthly German Bund (10 year bond) auction, which may have a knock-on effect on DAX. Otherwise the only news is PMIs. Manufacturing, services and composite are all reported. All estimates are comfortably over 50, the point between expansion and contraction. 3M (5.71% of the DJIA) report before the open. On Wednesday, the focus is on Australian inflation and the Canadian rate decision. Given recent RBA comments, it is not likely that a variation would have much effect. We recently seen AUD spikes on Australian news correct quickly, usually by the time Europe opens. Similarly, after the unexpected rate rise last month, and lacklustre data since then, a hold this month is almost certain. Of course we saw a strong CAD fade last Friday on the relatively small CPI miss. What Poloz says at the press conference may have more effect than the actual rate print. UK GDP is also important, given the high expectations of a UK rate hike in November. Visa (8.12% of the DJIA, the largest component) and Boeing (4.66%) report before the US open. Thursday is the big day, the ECB rate decision and conference. As in previous months, the press conference is where the volatility appears, and this month is crucial, as the detail of unwinding QE is expected. Commentators are expecting a dovish approach, because of recent Euro strength concerns (although EURUSD is down 2.6% from its Sep 8 high). So anything hawkish, such as immediate unwinding action, could cause a strong EUR upside reaction. We will be publishing our fractal on this event as usual. Amazon (6.53% of NDX) and Alphabet (9.05% of NDX across GOOG and GOOGL) report after the close. After a light week on US statistics, Friday is the big day, with GDP and PCE released simultaneously. Like Retail Sales, Personal Consumption Expenditure is a proxy for inflation. If both beat, or both miss, expect some USD movement. If one beats and the other misses, you will see which one is considered to be more important. The figures continue to be affected by the summer hurricanes. Chevron (4.43% of the DJIA) reports before the US open. The company has already said it was not affected much by Hurricane Harvey. Daylight savings in Europe and Mexico ends on Sunday Oct 29, and one week later in the US and Canada.